This is a 707-horsepower 2015 Dodge Challenger SRT Hellcat. It’s fast, it’s good for burnouts and it looks like it’s been oxidized over many years. Someone chose for the car to look like that, commissioning a wrap that likely cost a few grand to make it happen. Dodge doesn’t sell patina as a factory color. The car is up for sale now for $49,000 with a six-speed manual transmission and just over 13,000 miles on it, but all of that doesn’t matter to me right now. What matters is that I can’t stop staring at this wrap, trying to decide how I feel about it in the greatest existential debate I’ve had in, well, at least two days. The next owner can easily peel this wrap off and return it to its factory color, but for now, it looks like this and it’s got me all divided. The wrap is intriguing at first, until you stare too long and it looks like an antique piece of furniture you’d put on the back porch but not touch to avoid getting tetanus. You switch the tab on the computer to something else, doing other, more productive things, until you stumble upon the Hellcat again and begin the same debate cycle all over. Then, the debate gets deeper. Just ask my coworkers, who started arguing about the wrap as soon as I shared a link with them. Here, join us. This one was my main argument for a brand-new, rusty-looking Hellcat. I’m a big proponent of doing what you like and not being ashamed of it. Let’s be real; I buy the weirdest looking shoes I can find just because and I tweet about Yu-Gi-Oh more often than a working adult should. You do you, and I’ll do me. Plus, this is creative. 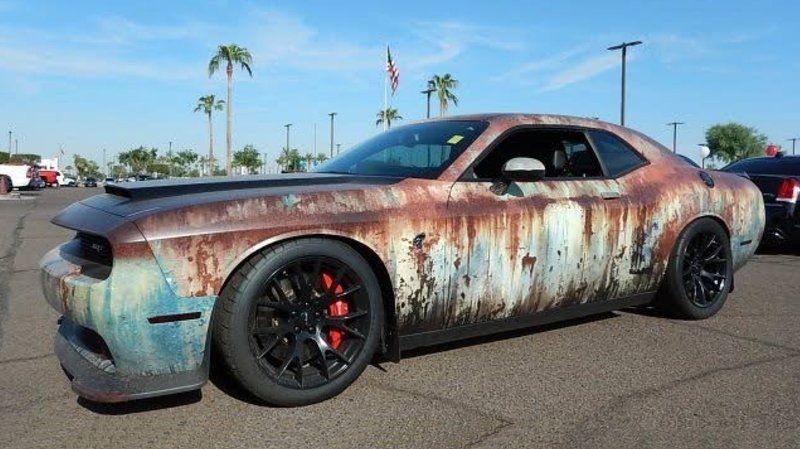 I mean, who buys a 707-HP Hellcat and decides to make it look all rusty? Debate solved. Until we get to the next argument, that is. This one spurred from our own David Tracy, as you would expect. He knows some things about real oxidation. He buys rusted-out cars without telling his coworkers first to avoid getting yelled at, after all. “Why make your car look like a shitbox, when you can just... buy a shitbox for like, tens of thousands less?” he asked. The debate continues. Crapcans are good. Everyone likes a good crapcan. But part of their appeal is that they’re cheap, so why not supplement a Hellcat with a cheap ol’ crapcan that has some natural oxidation charm all over it? Probably because crapcans require a lot of work. Either way, David makes a good point. The rust look is a lot more appealing when it doesn’t cost $50,000. Here’s where things get even more complicated. In response to David’s “Why make it look old and neglected?” argument, my colleague Kristen Lee asked why people buy ripped jeans. For fashion, of course. “Raph’s cutoff denim shorts are from him literally cutting up a pair of jeans,” she said. “I bought mine like that.” They really made my internal debate a lot worse here. I shouldn’t have brought it up. A Hellcat took us from the argument of simple appearance, to taking pride in your odd taste in things, to monetary investments, and then to whether or not we were allowed to opine on the matters of the wealthier. This is either one deep Hellcat, or we’re just over thinking it a bit. But at the end of the day, you do you. You may just have people debating their own feelings about life with the choice of wrap you put on your car.